Stormtroopers have kind of a bad reputation for being inept and notoriously bad shots, but it can't all be their fault. They wear bright white armor over their whole bodies and are practically blaster magnets. There are also so many of them that they tend to bunch up when heading into a battle. After the Old Republic was finally wiped out, these lowly foot soldiers probably didn't have much to do besides break up brawls and pull over ships that were breaking the light speed limit. So you can imagine why they might have gone a bit soft. 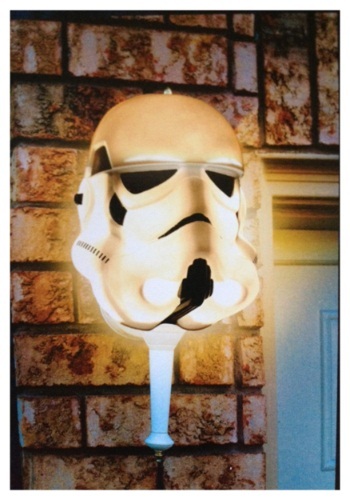 Show your support for these poor Imperial troopers by displaying a Stormtrooper Porch Light Cover on your house! These officially licensed home accents are shaped like the iconic helmets worn by the Emperor's spearhead soldiers as they stormed into combat. With the light cast by this cover, you can either show off your Star Wars love with pride, or help people remember stormtroopers back in their glory days!